The Blinds Summer Makeover Giveaway is open to non-customers and customers of Blinds.com over the age of 18, residing in the United States. The Blinds Summer Makeover Giveaway ends on June 29 at 11:59pm CST. $4,000 Patio Makeover to Blinds.com and The Home Depot. The sweepstakes prize is defined as one (1) Blinds.com Gift Card in the amount of $2,000 and one (1) Home Depot Gift Card in the amount of $2,000. 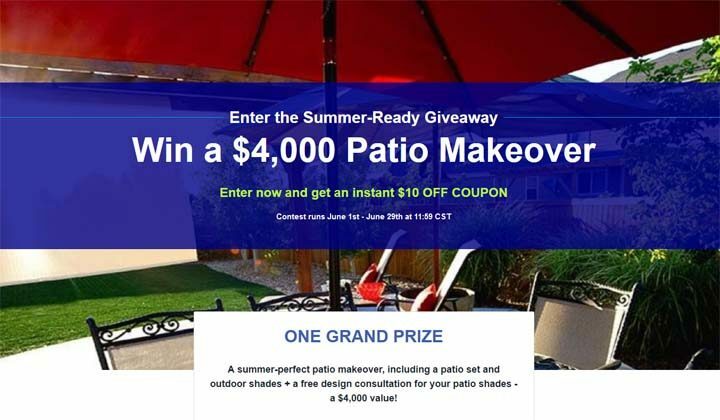 To be entered in the contest, entrants must follow the instructions on the Summer Makeover form at blinds.com/giveaway. One entry per person and per household.